Paris St-Germain missed out on the chance to go top of Ligue 1 after they were held to a 1-1 draw at Rennes. Laurent Blanc's men were well placed at half-time to claim a third win of the season after Zoumana Camara's slid home a shot to give them the lead. But the home side levelled 10 minutes into the second half thanks to an angled drive from Paul-Georges Ntep. The result leaves PSG second in the table, a point behind leaders Bordeaux, while Rennes are third. It was not the best of warm-ups for PSG ahead of Wednesday's trip to Ajax for their Champions League opener. However, they also lacked luck at times, with Zlatan Ibrahimovic cracking a volley against the crossbar. Camara's goal - which came from a cross from Gregory van der Wiel - made up for the Swede's near miss, but a defeat would have been harsh on the home side, who were rewarded for their contribution to the game through Ntep's close-range finish. Match ends, Rennes 1, Paris Saint Germain 1. Second Half ends, Rennes 1, Paris Saint Germain 1. Attempt missed. Steven Moreira (Rennes) left footed shot from outside the box misses to the left. Assisted by Abdoulaye Doucouré. Paul-Georges Ntep (Rennes) wins a free kick on the left wing. Attempt blocked. Blaise Matuidi (Paris Saint Germain) left footed shot from the centre of the box is blocked. Attempt saved. Edinson Cavani (Paris Saint Germain) right footed shot from the centre of the box is saved in the bottom right corner. Zoumana Camara (Paris Saint Germain) wins a free kick in the defensive half. Attempt missed. Yohan Cabaye (Paris Saint Germain) right footed shot from the right side of the box misses to the right. Assisted by Ezequiel Lavezzi. Substitution, Rennes. Anders Agnes Konradsen replaces Vincent Pajot. Ola Toivonen (Rennes) wins a free kick in the defensive half. Substitution, Paris Saint Germain. Yohan Cabaye replaces Javier Pastore. Corner, Rennes. Conceded by Zoumana Camara. Substitution, Rennes. Steven Moreira replaces Sanjin Prcic. Cheikh M'Bengue (Rennes) is shown the yellow card for a bad foul. Edinson Cavani (Paris Saint Germain) wins a free kick in the defensive half. Foul by Cheikh M'Bengue (Rennes). Vincent Pajot (Rennes) wins a free kick in the defensive half. Corner, Paris Saint Germain. Conceded by Sylvain Armand. Corner, Paris Saint Germain. Conceded by Romain Danze. Attempt blocked. Zlatan Ibrahimovic (Paris Saint Germain) left footed shot from outside the box is blocked. Assisted by Blaise Matuidi. Attempt missed. Ola Toivonen (Rennes) right footed shot from outside the box is just a bit too high from a direct free kick. Mexer (Rennes) wins a free kick in the attacking half. Corner, Rennes. Conceded by Salvatore Sirigu. Attempt saved. 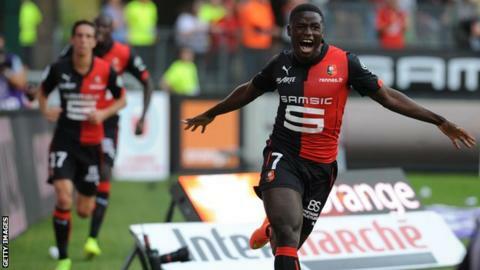 Paul-Georges Ntep (Rennes) right footed shot from the right side of the box is saved in the bottom right corner. Assisted by Ola Toivonen. Attempt saved. Zlatan Ibrahimovic (Paris Saint Germain) right footed shot from outside the box is saved in the centre of the goal.